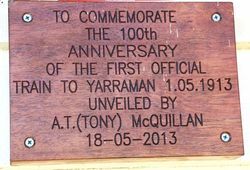 A plaque and tree planting commemorate the centenary of the Yarraman railway. 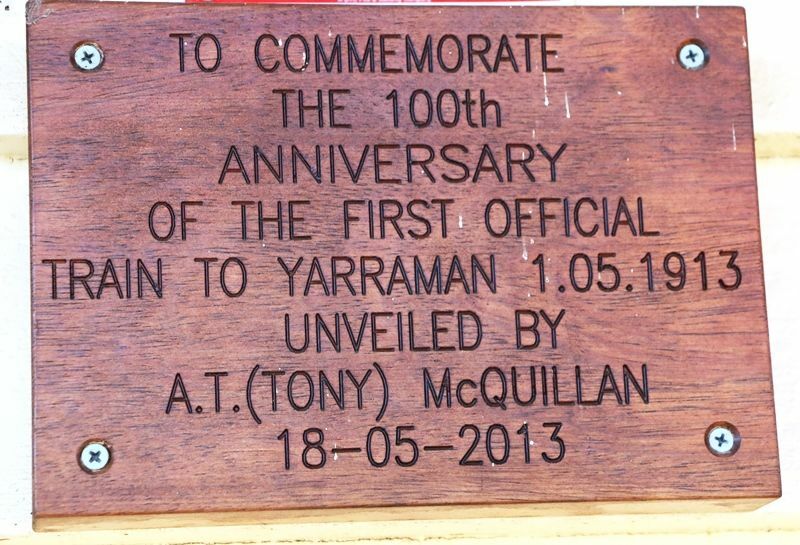 In May 2013,Yarraman marked the 100th anniversary of the arrival of the first train to the town (May 1, 1913), with a range of celebrations. The oldest former railway man in attendance was Tony McQuillen, 87, who travelled from Banyo for the occasion. Tony used to work as a lad porter on the rail motors running from Toogoolawah to Brisbane. He was invited to unveil a special plaque affixed to the old railway station building to mark the centenary. Also to mark the occasion, Jeffrey Muckert, a former station master at Yarraman for many years, planted a crows ash seedling in the Heritage House garden. YARRAMAN CREEK RAILWAY. At 4 p.m. to-day the Minister for Railways (Hon. 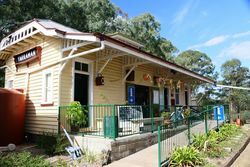 W. T. Paget) will officially open the Benarkin to Yarraman railway. To celebrate the occasion a banquet is to be held this evening. Elaborate preparations have been made for the function, and, given fine weather, there should ba large gathering of spectators. Queensland Times (Ipswich), 1st May 1913.